Sometimes when you dread something and it makes your heart hurt, you pray. You pray for a way to get past the uneasy moments and you hope to find a hand to hold from someone who understands. And, sometimes you may be lucky enough to realize you didn't have to pray that hard. That someone was there all along and you just didn't see clearly how much you needed them. Or how much they maybe needed you too. This is what happened to me last week. I went looking for a way out. A fast forward button through a tough week is what I wanted. There was a bury my head in the sand sort of desire that wouldn't quit. Except for one thing. I came to the somewhat ridiculous realization that I had the option to go to the cemetery. Would you believe I had never thought about it before now? Maybe my subconscious was holding me back all this time. When the realization hit it pretty much took me out for a day. And then suddenly, just like that, I had to go. I was going to pack up my girls on Thursday and drive two hours to do what? Go say happy birthday? I wasn't sure. These things are new to me. I just knew I had to go. This started a series of text messages with my cousin Holly. Before I knew it, we were in her car on Friday driving there with my girls and her daughter Lily in tow. Something that felt so awful and hard became a beautiful bonding experience. I'm not going to say it wasn't still very, very hard. But, it was manageable. Holly gave me a gift this weekend. She helped me in more ways than she will ever know. All I could picture was her mom and my dad looking down and smiling. Beyond the tough stuff, we let ourselves relax and enjoy two days of eating snacks and watching movies. We played with doll houses and train sets. 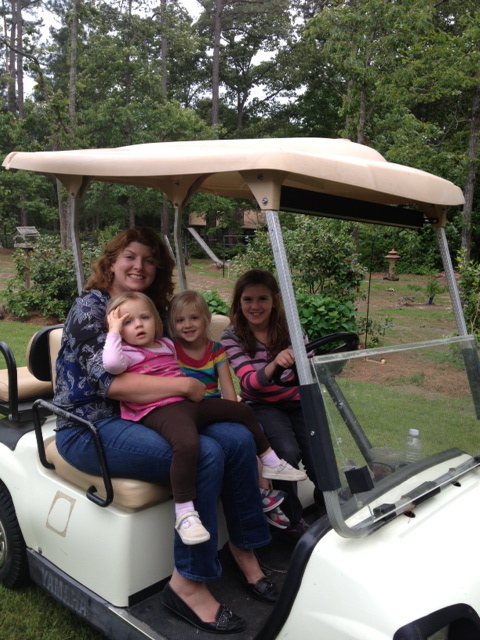 We rode uncle Murray's golf cart around his backyard. 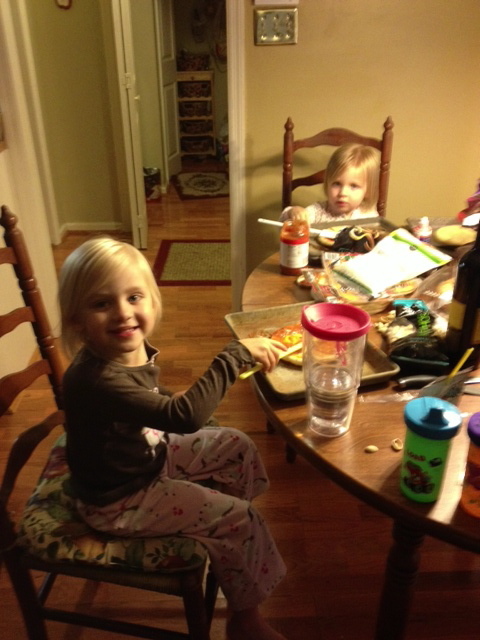 We made mini pizzas and my girls snuggled on the couch with the cousin I grew up adoring and idolizing. It was perfect. Sometimes hard things can be perfect in their own way. If you reached out to me last week, as many people did, I can't express enough how grateful I am. Support systems are a wonderful thing. Also, totally unrelated, that sleepy little face in the first picture above turned TWO today. My Cinco de Mayo baby fills my heart to the brim. My cup is overflowing amidst the hard stuff as you can see by those sweet faces. More on the world of two year old Evie coming soon. I'm glad you were able to find happiness in such a hard week. Love you Jana! Thoughts like this hit you just when they're supposed to, and God puts that perfect person in your path when the path seems unbearable to walk alone. I love you for being there for Holly, and her for being there for you.